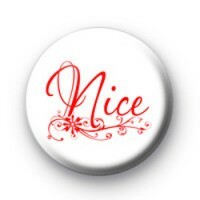 Naughty or Nice badge in white with red festive text which reads nice. Inspired by Santas naughty & nice list, we have naughty badges and nice badges in various styles, which are ideal to give out to friends, family & the kids to say if they have been naughty or nice this year. If Father Christmas has got you on his Nice list, you need to wear your nice badge with pride. We have a great range of hundreds of Christmas badges so be sure to have a browse through the rest of our Xmas badge category. Standard 25mm badge made by hand in our family workshop.